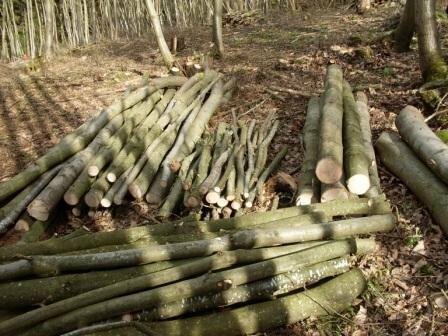 Posts, poles and rails sourced from coppice woods can be sold in the round, split half round, cleft or sawn and can be used for a range of purposes including posts for securing fencing, tree stakes and bespoke garden projects such as rustic furniture or arbours. Materials are graded to a variety of sizes and lengths and normally sold in lengths to the nearest foot but often coppice workers will supply to your specification. Chestnut coppice and the heart wood of oak coppice are favoured because of their natural resistance to rotting, particularly important for posts that will have contact with the ground. Other coppiced wood can be used depending on the end use. The increased environmental awareness and concerns of the use of chemicals for preserving soft wood has made coppiced materials more popular.